Perfect Configuration: Based on Android 7.0,Powered by Quad-core ARM Cortex TM-A53, 2G/16G make big games run more smoothly,802.11ac dual-band WIFI,1000M network interface carefreely shows in front of audience with 10 times speed through current mainstream 100M ,without any pressure limit. Fantastic ZIUI: ZIUI is based on android system,you can have simple APP management,easily find video music pictures file and no need exchange from different APP,support setting passcode of any APP. For Watching: ZIDOO H6 Pro offers 4K*2K H.265 Hardware Decoding UHD video playback,support 4K@60fps HD Audio(7.1CH) passthrough,24P frame rate auto switch,support hardware decoding,Support BD iso,BDMV,BD rip,BD 3D MVC format playback on video player. 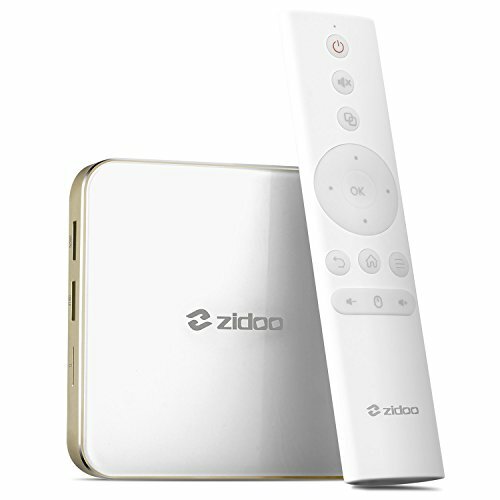 RC & IR Shortcut: Through ZIDOO RC,you can use your favorite operating way to control H6 Pro with your cell phone.The new smart IR remote with progrmmable keys offers a great easy way to control not only the H6 Pro but also the TV at your home,It also supports three programmable color-keys that customizes to open apps quickly. If you have any questions about this product by Zidoo®, contact us by completing and submitting the form below. If you are looking for a specif part number, please include it with your message.